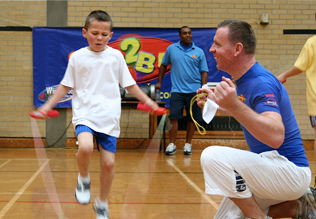 At Skip2Bfit we promote skipping as a fitness activity for everybody. We work with schools, public health and community events and corporate events. 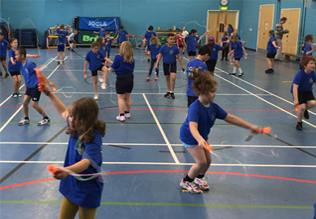 Our Youth Sport Trust award winning, skipping workshops use our specially designed counting skipping ropes to incorporate numeracy whilst promoting fitness and healthy living. The Innovation Award was given to recognise the work of skip2bfit in incorporating school improvement with physical exercise. We passionately believe that skipping is one of the best exercises you can do as it gives you the fundamentals of all sports i.e balance, timing and footwork. We have been teaching this in schools since 2002 with our workshops, which allow all of the children in the school to participate and achieve. We use tactile learning to encourage children '2B the Best that YOU Can B'. The sessions are great fun and pupils love the challenge set them. OFSTED reports have commented on the good use of sport premium for schools booking Skip2Bfit and have also rated a school outstanding for pupil development, where the school introduced the skip2bfit and box2bfit fitness challenges on a daily basis, after having our workshops. We also provide free blueberries as we believe that exercise and eating healthily go hand in hand. Our Adult Programme works within communities promoting skipping as a way to get active and keep fit. What better way to test your fitness. 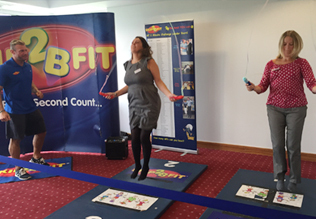 Have a go now using the Skip2Bfit App which is the world's first Voice-Over Motivational Skipping App.